One, two, three ... nope, I saw only three guys hanging outside of Five Guys Burgers and Fries in Seekonk this day. Must be because the rest were running into this very popular burger and fry restaurant along with a ton of other hungry people. Laura and I arrived at 1:30 p.m. on a chilly Saturday afternoon. We were trying to avoid the Christmas shopping craziness by having a quick lunch and taking in a cheap movie. We'd never tried Five Guys but had heard lots of good things from those who have. The place was mobbed with holiday shoppers looking to raise their blood sugar after hectic mornings of gift-buying. 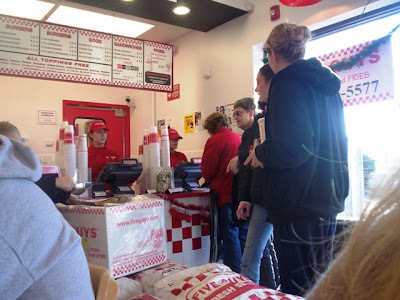 It was also mobbed with people like us, just wanting to grab a good bite. There was quite a line and all the available seats seemed to be taken. The place was a noisy, cheerful, somewhat chaotic scene. But then our luck changed and the very first table, in the front of the restaurant was vacated. I guess we were good for Santa. I jumped into the chair (well, walked) and Laura got in line to order. View of the "pick up" area. Although very busy and crowded, they have a pretty good system for getting you in and out (or seated). 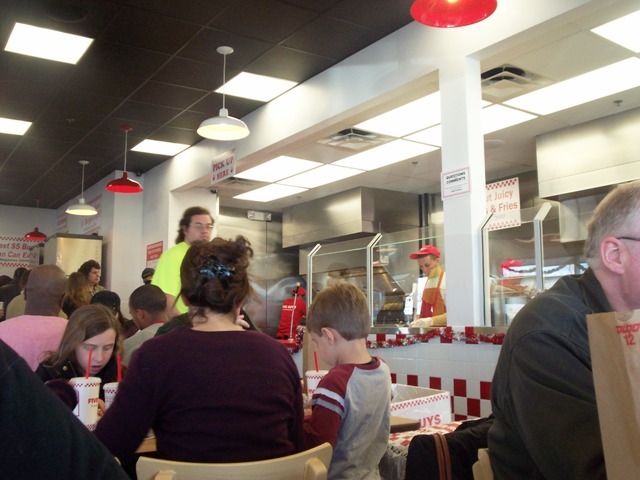 You get in line right as you walk in, the menu is overhead, you order and pay, then move down to the pick-up line. The pick up section gets a bit mobbed but you really don't have a long wait. Then try to find a seat or better yet have a friend scout the seats while you get the food. That's what we did. The menu here is short and sweet. They have burgers, cheeseburgers, bacon burgers and bacon cheeseburgers (their regular is a double patty, but you can get the little burger - a single patty). 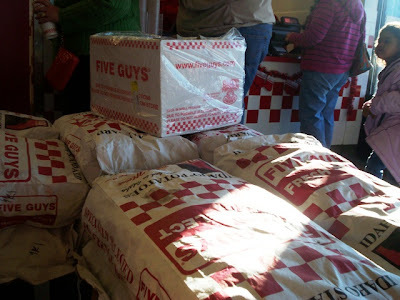 They have "Five Guys style" (i.e., plain) and Cajun fries. A regular size fry was enough for Laura and me with some to spare (can't imagine the large size). They have regular and large size sodas, which are refillable and also bottled water. Not in the mood for a burger? How about a Kosher hot dog, cheese dog, bacon dog, or bacon cheese dog? Maybe you'd prefer a veggie sandwich, cheese veggie, or a plain grilled cheese. 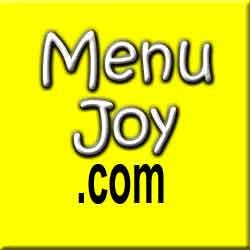 You can have any of the above with a variety of toppings (grilled onions, grilled mushrooms, tomatoes, etc.) which are all free. And that's the whole menu. Laura got a little cheeseburger and I got a little hamburger (one patty each) and a regular fry to share and two regular sodas. I got ketchup on my burger (that's pretty wild for me) and Laura (ever the show-off ) got grilled onions and barbecue sauce on hers. Again, no charge for the toppings. 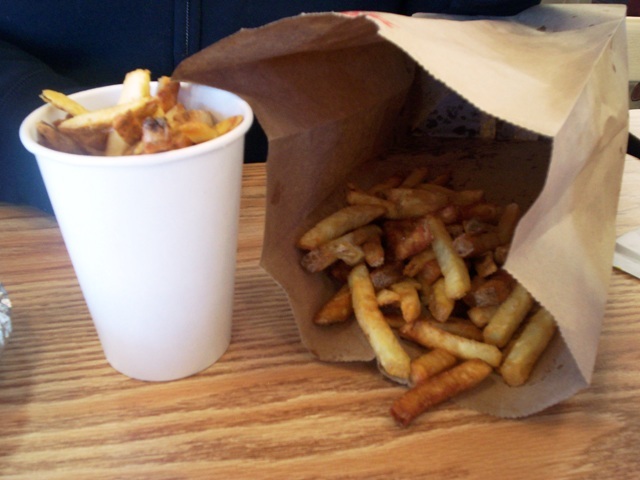 It seems like after they fill your cup with fries, they throw another big scoop of fries into your bag, because when we took our order out, the bottom of the bag was filled with fries. I ate those while Laura ate from the cup. We couldn't finish them. Cheeseburger with BBQ sauce and grilled onions. Small "Five Guys style" fry. THE VERDICT: These were some tasty burgers and fries. No uniform patties here. All burgers are fresh, hand-formed, and perfectly done. The fries are terrific also. They were hot, hand-cut, with a crisp outside and a creamy potatoey inside. 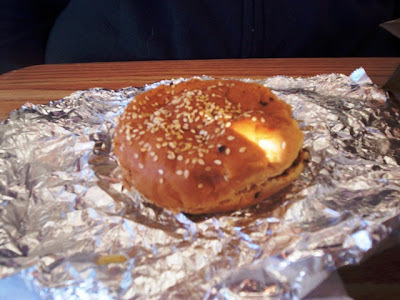 These were definitely better than a regular fast food burger and fry. I know where to go for a good burger now and I'll even put up with the crowd. They're that good. P.S. - For those of you with peanut allergies ... beware. There are stacks of peanuts when you first walk through the door, right near the order line. You get a little cardboard container and then help yourself. Fun and generous of them but dangerous for those who can't tolerate the little legume. Also, the fries are cooked in peanut oil. 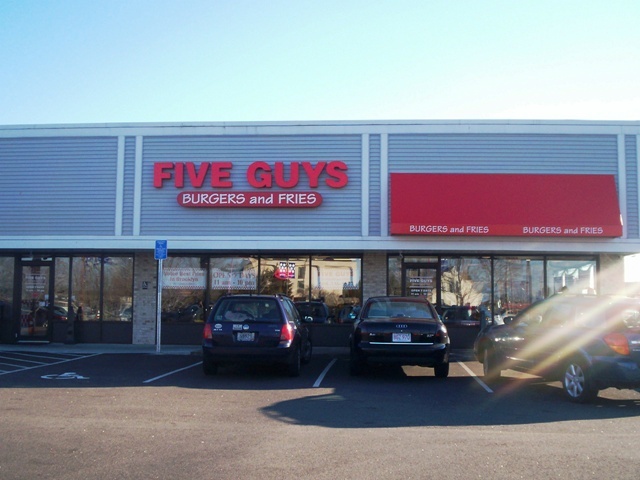 The Five Guys Burgers and Fries in Seekonk is located at 1080 Fall River Avenue. 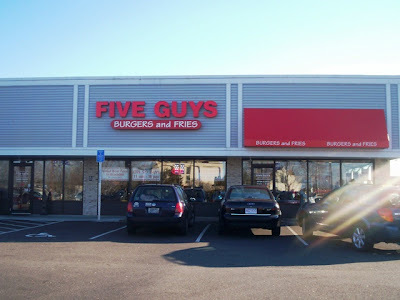 For more information, call (508) 336-5577 or visit the Web site at FiveGuys.com. 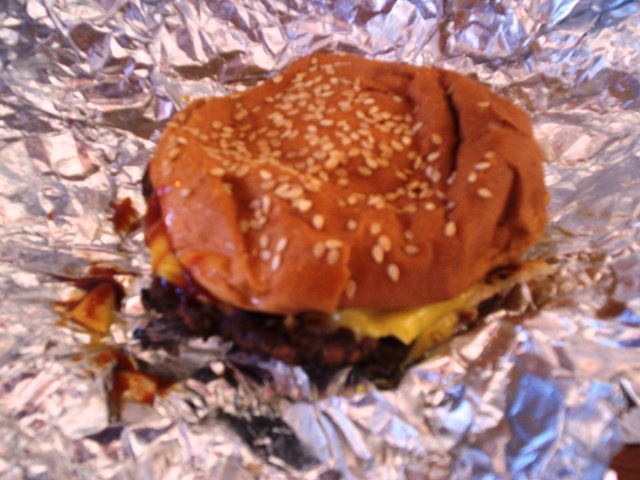 Five Guys Burgers and Fries is open daily from 11 a.m. to 10 p.m.